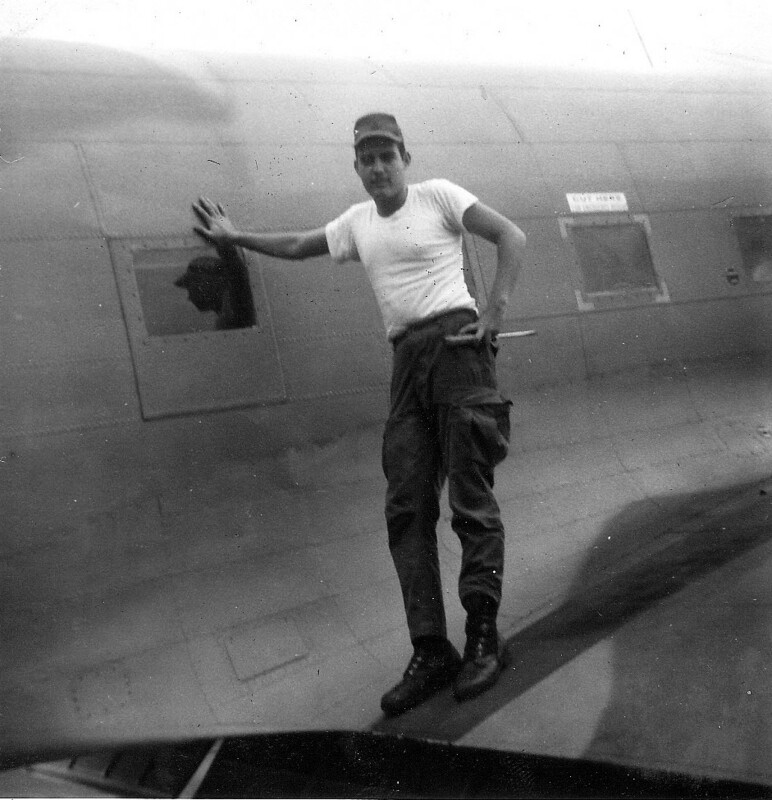 Ken Flood, former maintenance type with the 360th TEWS, sent some photos of his airplane, "Old Mr. Ross." 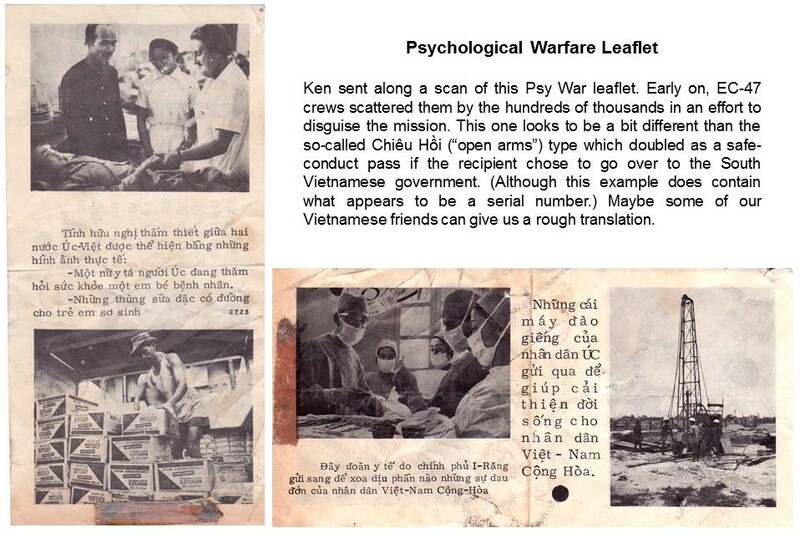 Ken says: "I was assigned to the 360th, 1968-69. I don't remember the tail #'s but I have a few photos for you. Unfortunately, you will have to see me in them too—sorry about that. Also have a scan of one of the notes that were dropped while in flight. I was a lowly A1C at the time but stayed in for 20 and made it to MSgt. If you can find out the tail # OLE MR ROSS was I would like to know it and maybe do a little research on it." 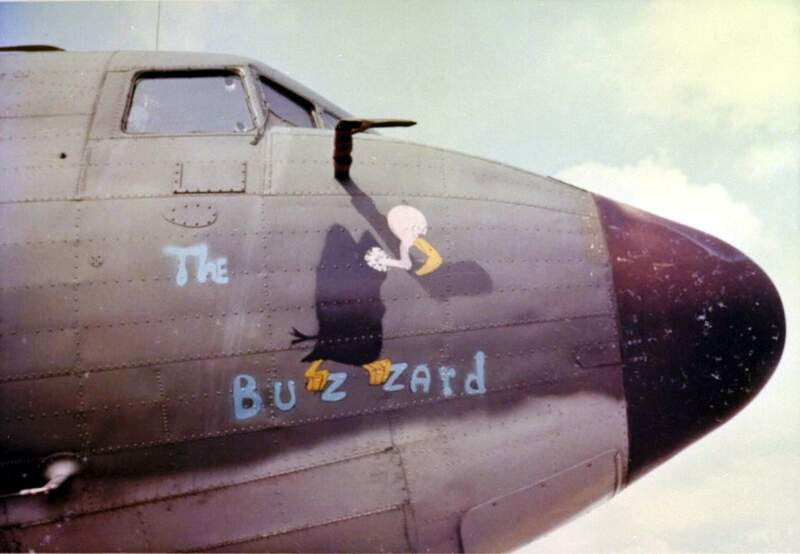 Without at least a partial serial number, we can't further identify the aircraft, but we did find a color photo of the nose art. Ken says it was that way when he arrived; he has no idea where the name came from. Neither do we. 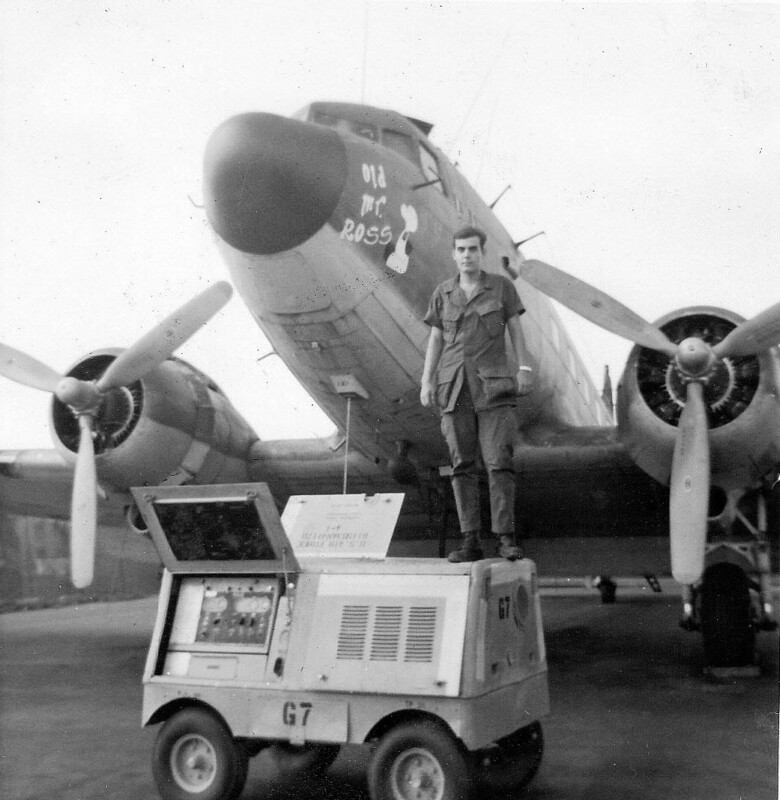 But we can see that the aircraf was one of five equipped with the QRC-346 jamming system. 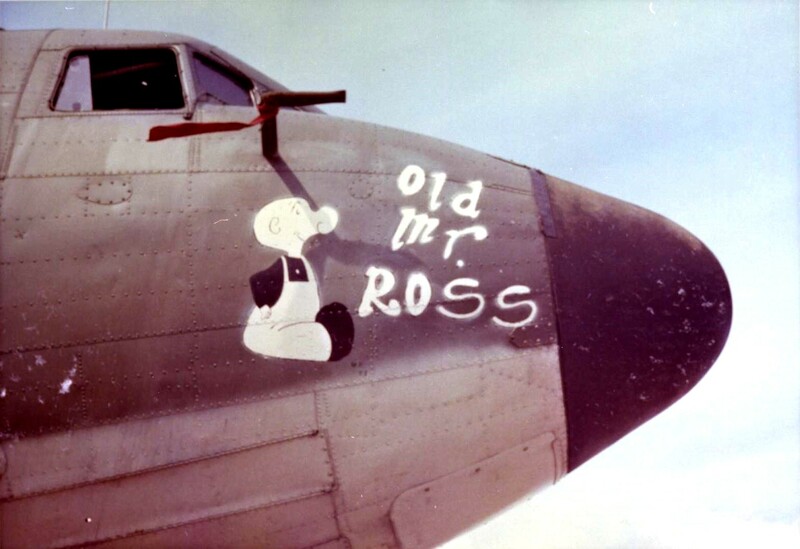 We started with the nose art, which appears to be the youngest offspring, "Tater", of the cartoon character Snuffy Smith. 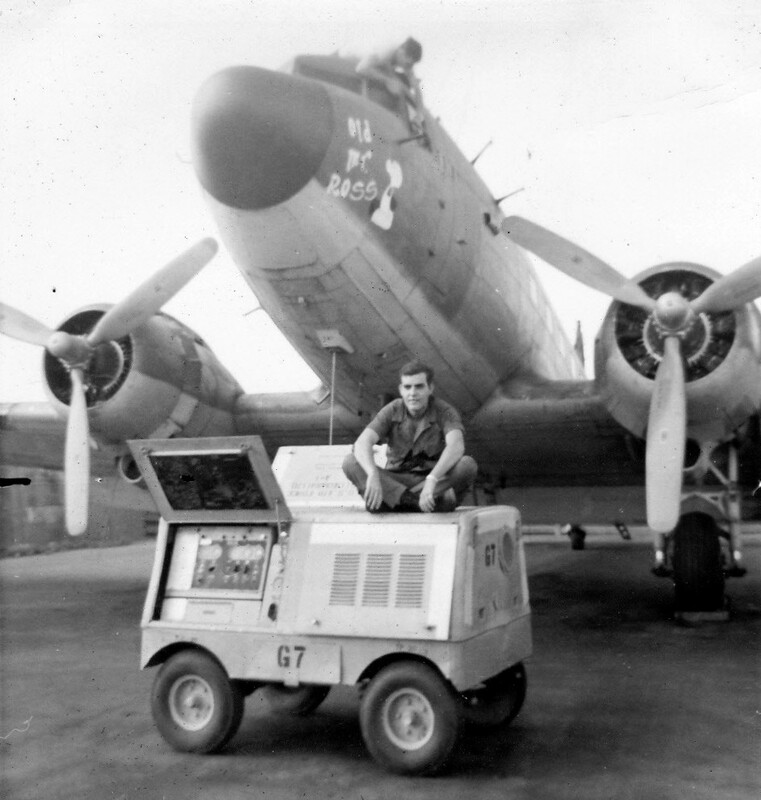 Only five EC-47s were "jammer" equipped, and we know that 43-15603 was "Buzz Off" (shown elsewhere). That leaves 42-100513, 42-100984, 43-16055, and 43-16123 as possibilities. A quick check of the photo archives by serial number yielded the picture below. It's not super sharp, but that little white blob on the nose is roughly the shape of Tater's head in Ken's shots above. The name doesn't appear to show here, but we're still guessing the best candidate for "Old Mister Ross" was 42-100513. Bad guess . . .
Eagle-eyed Chuck Miller enlarged the nose section of this shot and concluded, correctly it seems, that the nose art is actually "The Buzzard", S/N 42-100513 which was the aircraft which logged the 360th's 80,000th accident free flying hour. The investigation continues! Have we finally nailed that sucker ? 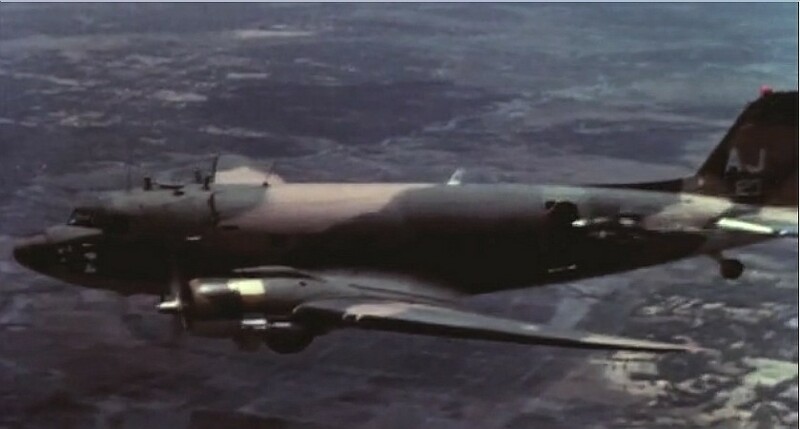 Around the six-minute mark of the long version of the "Antiques Airlines" video, there are several seconds of leaflet dispensing—maybe the exact type shown above. The video isn't very clear, but it's obviously one of the "jammer" birds, and the "last three" sure looks like 123. (S/N 43-16123) The artwork is too indistinct to tell for sure, but if this isn't Ol' Mr. Ross, then we give up!